Youth Vote: Technology Silicon Valley sends ambassador to Trump's coal country 'The election was a wakeup call,' says Rep. Ro Khanna, who came to eastern Kentucky to see what the tech industry and Appalachia can offer each other. By Nancy Scola 03/26/17 07:19 AM EDT Updated 03/27/17 10:50 AM EDT Rep. Ro Khanna (D-Calif.) and Appalachian Regional Commission (ARC) Co-Chair Earl Gohl chat as they head from the Big Sandy Community and Technical College main building in Paintsville, Ky. to the Interapt coding bootcamp across the street. Interapt has partnered with the state and county to train people and families of the coal industry to be computer coders in an effort to create a "Silicon Hollar". Rep. Ro Khanna and Appalachian Regional Commission Co-Chairman Earl Gohl chat as they head from the Big Sandy Community and Technical College main building in Paintsville, Ky., to the Interapt coding bootcamp across the street. | John Shinkle/POLITICO Facebook Twitter Google + Email Comment Print Most Read Congress may stiff Trump on wall funding Schumer headed for epic clash with McConnell Trump tweets: 'Russia story is a hoax' Swalwell on Nunes fallout: ‘This is what a cover-up to a crime looks like’ Trump signs order to end ‘crushing attack’ of Obama climate legacy Pruitt takes fire from conservatives in climate showdown Mar-a-Lago can't release visitor logs — because it doesn't keep them Graham: Nunes is running ‘an Inspector Clouseau investigation’ How Bill Nelson shook up the Gorsuch confirmation fight Trump won’t throw first pitch on Nationals opening day Politico Magazine 15_donald_trump_44_ap_1160.jpg Four Things Trump Could Do Right Now To Fix Obamacare By Michael Grunwald 170328-vladimir-putin-ap-1160.jpg How the Sanctions Are Helping Putin By Andrey Movchan georgeWbush_gty.jpg What George W. Bush Can Teach Trump About the Press By Matt Latimer 170326-Donald-Trump-AP_842193980079.jpg Trump’s a Dictator? He Can’t Even Repeal Obamacare By Francis Fukuyama PAINTSVILLE, Kentucky — President Donald Trump won this state by a landslide after promising to reopen Appalachia’s coal mines and put its miners back to work. But here, along the banks of Paint Creek in eastern Kentucky’s legendary coal fields, some displaced workers are pinning their hopes instead on Silicon Valley. And the celebrity of the moment is California Democratic Rep. Ro Khanna, who came from the Valley’s deep-blue heart last week to see what this emptying corner of coal country might have to offer the technology industry — and how Appalachia can reap its benefits in the form of jobs and tech training. "It's just exciting for them to think what we're doing is interesting enough to make the trip," former coal worker and budding app developer Steve Bowling said in a cinder-block classroom in Paintsville — referring to Khanna and, by extension, the tech industry itself. "That means a whole lot to us." The 40-year-old freshman congressman and son of Indian immigrants might seem an unlikely ambassador to a conservative region: He supports what he calls “common-sense” gun laws, not to mention the Obama-era energy regulations that the coal industry blames for shuttering dozens of coal plants in the past decade. But he hopes that by expounding upon the Silicon Valley success story across the U.S., he might help boost the economic prospects of places like Paintsville. And if he can convey the woes of non-coastal regions to leaders back home, the tech industry might find a way to steer where the country goes from here. “The election was a wakeup call about how much discontent there is from technological progress and globalization, that it’s not just all a clear good thing,” Khanna said in his still-bare Capitol Hill office just before his trip, where he visited a training program for mobile app developers at Big Sandy Community & Technical College. And it’s time, he said, for an industry that has played a role in shedding American jobs — by advancing artificial intelligence, among other things — to invest in helping communities like this one share in the upside. “There’s got to be greater empathy among those in Silicon Valley for some of the pain that has been caused,” he said. At the same time, he’s looking to spread Silicon Valley’s aspirational spirit around a country in need of big thinking. “It's just getting people to dream that they can go try to be like Elon Musk or Steve Jobs,” Khanna said. 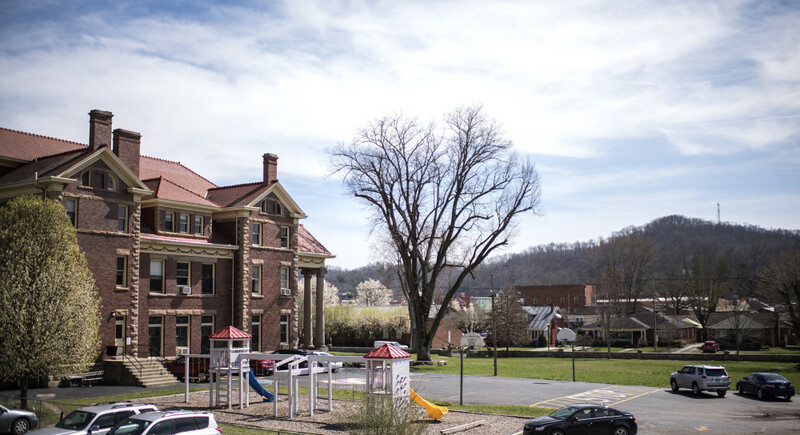 The 43-room mansion of John C. Mayo, a teacher-turned-entrepreneur regarded as the father of the eastern Kentucky coal industry, is now the home of Our Lady of the Mountains School. The 43-room mansion of John C. Mayo, a teacher-turned-entrepreneur regarded as the father of the eastern Kentucky coal industry, is now the home of Our Lady of the Mountains School. | John Shinkle/POLITICO Khanna came here at the invitation Kentucky Rep. Hal Rogers¸ a 79-year-old Republican who joined Congress the year Ronald Reagan moved into the White House. Rogers' sprawling district is among the poorest in the country — ranked 432nd out of 435 in median per-capita income according to the Almanac of American Politics — and the setting for the best-selling guide-to-Trump-country "Hillbilly Elegy." By contrast, companies including Apple, Intel, eBay, Yahoo, LinkedIn and Tesla are all stuffed within Khanna’s overwhelmingly Democratic, wealthy and compact district; Google, while headquartered in nearby Mountain View, has offices there, too. Republican Gov. Matt Bevin and Megan Smith, the Google executive who served as Barack Obama’s U.S. chief technology officer, also came to the event, giving speeches and chatting over foam-containered chicken salad sandwiches and potato chips. But for the crowd of about 150 people, Khanna's attention was what they craved. Rogers was eager to have him in what he calls “Silicon Holler,” because Khanna has quickly become a one-man proxy for a swath of glitteringly brand-name and geographically concentrated Silicon Valley companies. “It’s a chance for us to sell him, and therefore them, that this is a place to look at," said Rogers. That he's actually come, joked Earl Gohl, co-chairman of the Appalachian Regional Commission — founded in 1963 by President John F. Kennedy — makes Khanna his “new best friend.” Still, shortly after he stepped off stage with Khanna, Rogers fielded a question on whether he holds any bad feelings over the tech industry’s growing disdain for coal, such as Facebook’s new hydropowered data center in Luleå, Sweden. His answer? If the goal is keeping Appalachian people in the rolling hills of Paintsville and Pikesville and Harlan County, not fleeing to places like Ypsilanti and Cincinnati, America’s tech boom might be the last best hope. “We can't afford to be too resentful," said the Republican. “We'd rather sleep here.” Republican Kentucky Gov. Matt Bevin, Rep. Hal Rogers (R-Ky.), former U.S. CTO Megan Smith, Rep. Ro Khanna and Appalachian Regional Commission Co-Chairman Earl Gohl chat March 13 before a round table luncheon on developing Eastern Kentucky from a coal based economy to a "Silicon Holler." Republican Kentucky Gov. Matt Bevin, Rep. Hal Rogers (R-Ky.), former U.S. CTO Megan Smith, Rep. Ro Khanna and Appalachian Regional Commission Co-Chairman Earl Gohl chat March 13 before a round table luncheon on developing Eastern Kentucky from a coal based economy to a "Silicon Holler." | John Shinkle/POLITICO Khanna, a lawyer and former official in the Obama-era Commerce Department, came to the tan-bricked, 1950s-built community college, where every other car in the parking lot is a hulking, mud-spattered American-made pickup truck. Founded in 1790 as Paint Lick Station, this is a town that honors its coal history. The bricked-and-columned 43-room mansion built on the cusp of World War I by John C. Mayo, the teacher-turned-entrepreneur regarded as the father of the eastern Kentucky coal industry, stands a block over. It’s now Our Lady of the Mountains School. But gone are the days where you could get a $70,000 job in the mines with a ninth-grade education and buy one of the lovely homes dotting the hills here. Since 2008, coal jobs in eastern Kentucky have dropped from more than 14,000 to fewer than 4,000. And even the jobs still available don't look like a smart long-term bet, making scraping out a living underground even less attractive than it's ever been. The event on display here, convened more or less in Khanna's honor, amounted to speeches, a roundtable discussion and demonstrations about a program called TechHire Eastern Kentucky, or TEKY — pronounced, conveniently, "techie." The program, backed by $2.75 million in federal funds, trains a crop of would-be mobile app developers for four months and puts them in a four-month paid internship with a Louisville software company called Interapt. (That money flowed through the Appalachian Regional Commission, which Trump, in his first budget, included on the list of agencies he’d completely defund. Rogers called those cuts “draconian, careless and counterproductive.”) TechHire, begun as a federal program in the Obama White House in 2015, was inspired by the tech industry's complaint that it has 600,000 job openings it can't fill, a major drag on its bottom line and ambitions, and part of its justification for seeking more visas for specialized workers from overseas. But the people who have brought Khanna argue that this crunch exists partly because the industry simply doesn’t hirethe sort of people sitting in cinder-block classrooms in eastern Kentucky. The former coal worker Bowling, 41, said his wife found out about TEKY on Facebook after he’d beenlaid off from a job in a coal mine filling blasting holes with ammonium nitrate. He chose the Android app training track over the more structured Apple iOS trackbecause his instructors "described it as, 'It's the Wild Wild West.'" Others have come to the program to avoid coal. Sean Crowl, 29, says he lost his job when the Kmart in town closed. Crowl sat at a roundtable of young men — the class of 35 trainees, from a pool of 800 applicants, is overwhelming male and white — who came from a bank, a school, a restaurant or unemployment to build apps like one for a local nonprofit that helps track elementary school students' reading progress. The $400 a week was appealing, as a two-bedroom apartment can be had here at that price. (One trainee says it was so good he thought it was a "scam" until he heard about the paycheck.) All six said four months was plenty of time to learn how to build apps good enough for the Google Play marketplace or Apple's App Store. Interapt CEO Ankur Gopal and Rep. Ro Khanna speak with trainees in the TechHire Eastern Kentucky coding program at the local campus of Big Sandy Community and Technical College on March 13. 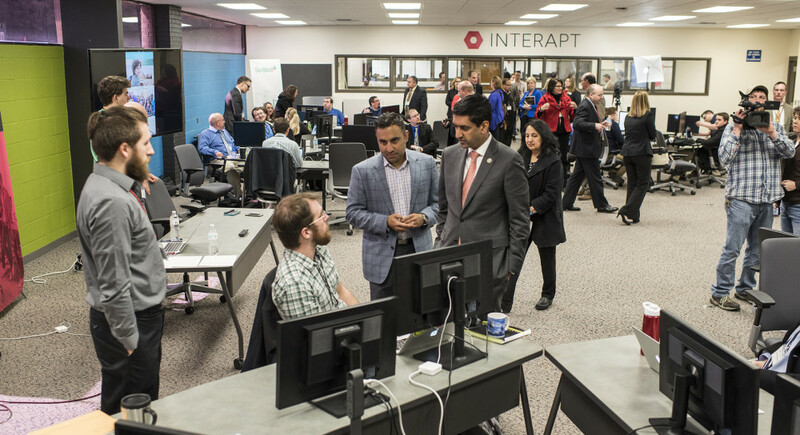 Interapt CEO Ankur Gopal and Rep. Ro Khanna speak with trainees in the TechHire Eastern Kentucky coding program at the local campus of Big Sandy Community and Technical College on March 13. | John Shinkle/POLITICO The pitch Rogers and others are making here is that Silicon Valley hiring managers would be smart to open their eyes to places beyond San Francisco and New York — and they’re pitchingeastern Kentucky as the type of undervalued investment that venture capitalists love to go on about. They argue that the internet erases some of the region's traditional limitations, such as a dearth of well-maintained roads in many places, as well as of flat ground for building factories. The people say they are hard-working and open to low wages. And unlike, say, Bangalore, it's in a reasonable time zone. But for all the tech industry’s talk of meritocracy, "when employers say they can't hire people with skills, what they're really saying is that they can't find people with a certain pedigree," said Byron Auguste, a former deputy director of the White House National Economic Council who helped create TechHire. Auguste is now president of Opportunity@Work, the non-profit group administering the program. The result, he said, is that people from places like Paintsville don't get access to the enormous sums that companies like those in Khanna's district invest in training. "People are on the outside looking in, forever," Augustesaid. “People say, ‘How many former coal miners can learn to code?’ And my answer is, it’s too early to tell. Only a handful have been given an opportunity, and they’ve done pretty damn well.” Of Khanna, Auguste said: “We want him to be able to go back to Silicon Valley and his constituent companies and say, ‘No joke, there’s really a lot of talent here.’" Being taken seriously is, in fact, a recurring theme. Interapt CEO Ankur Gopal wants Khanna to see that what's going on here isn't some “cute thing.” Jared Arnett, executive director of Shaping Our Appalachian Region, quotes a colleague saying he wants to prove “we're not just a dancing bear.” Khanna said he's listening. "The tech companies and tech industry have an incentive to rethink their own labor practices so that they aren't just hiring in Stanford and Santa Clara, but are broader about what their hiring practices are and the skills they need," he said. That said, Khanna told the crowd in Paintsville, "it has to be a partnership. I don't think it's an act of Silicon Valley's charity. It's in their interest to harness the talent, the energy and the spirit here. That's going to make their companies better. That's going to make our country better." And that, says Khanna, is what he's going to go back and tell the tech industry. khanna rogers silicon valley chart (002).jpg The event includedno talk of Trump, his campaign pledge to “bring those miners back” or the attackshe's heaped on the tech industry for everything from manufacturing its products abroad to refusing to open up its consumer products to law enforcement. But Auguste said the warm feelings for the tech industry evident at Big Sandy Community College aren't widely distributed across the U.S. “The country should love Silicon Valley. It’s a gem and a treasure,” he said. “But when push comes to shove, in a lot of parts of the country, it’s difficult to find people who’d say, ‘Silicon Valley has done much for me.’” Khanna said he also wants to help his own home-district industry expand its thinking on Silicon Valley’s role in society. “What I want to do is to help shape the thinking of the Valley to start caring more and engaging more in policy that's not narrow,” Khanna said. “You get almost the same talking points about [tax] repatriation, encryption, patent trolls. I say, ‘What an impoverished vision for a place that literally believes it wants to change human civilization.'"